I've accumulated a lot of stuff over the years, most of it stemming from my passion for collecting miniatures & related paraphernalia. 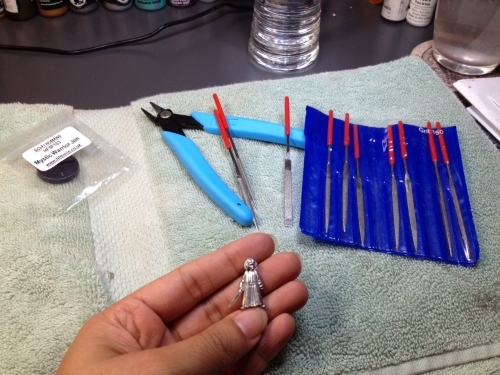 After having a certain holiday song stuck in my head, I decided to write about a few of my favorite things related to miniature painting. First off, I fully-admit I have too many bottles of paint. I've long-admired the organizational systems of those who custom-craft works of wood. However, these plastic paint bins make my life much easier as they prop up and can be easily accessed on my table. I have three-- one with neutrals and browns, another with muted colors, and the third with bright colors organized by hue & value. In addition to my paint organization, I hold my Optivisor near & dear to my heart... or rather, my eyes-- not only mine, but the eyes I paint on miniatures. At first, I was wholly uninterested in bulky, magnifying lenses that claimed to lend itself well to the art of miniature painting. However, these were given to me as a gift, and after getting used to them, I have to say: they really do make a positive difference! I find that my eyes are strained less and it's much easier to use since they're essentially strapped to your head. They conform to the very angle of your vision and, despite looking pretty goofy, are indispensable when it comes to detail work! My last two favorites are the micro clippers and my files. I use these immediately after I free the miniature from its packaging. I use the clippers to trim the flash (a.k.a. "sprue") and the files to banish & smooth mold lines. With these tools, I set myself up for success before I even begin to paint! You're doing yourself a huge favor if you take your time during these steps! (Trust me, I've seen the results when you skip these steps and they're not pretty). The other two audio files are in progress!